Constructed: Late 12th - Early 13th century C.E. 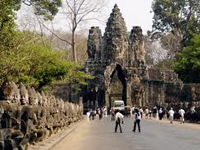 Angkor Thom (Big Angkor) is a 3 km2 walled and moated royal city and was the last capital of the Angkorian empire. The atmosphere at the moat is impressive in the morning, see the picture below. 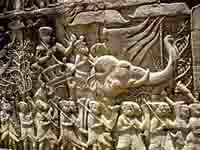 After Jayavarman VII recaptured the Angkorian capital from the Cham invaders in 1181, he began a massive building campaign across the empire, constructing Angkor Thom as his new capital city. 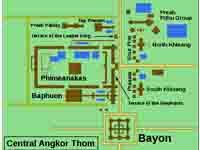 He began with existing structures such as Bapuon and Phimenakas and built a grand enclosed city around them, adding the outer wall / moat and some of Angkor's greatest temples including his state-temple, Bayon, set at the center of the city. There are five entrances (gates) to the city, one for each cardinal point, and the victory gate leading to the royal palace area. 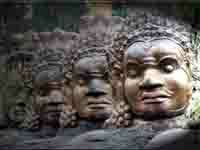 Each gate is crowned with four giant faces. 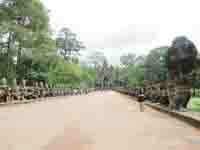 The south gate is often the first stop on a tour to the temples.